On Friday, May 1st – 6 highly focused and dedicated judges walked in to my home with the monumental task of selecting the winners of the 4th Annual Life of an Architect Playhouse Design Competition. 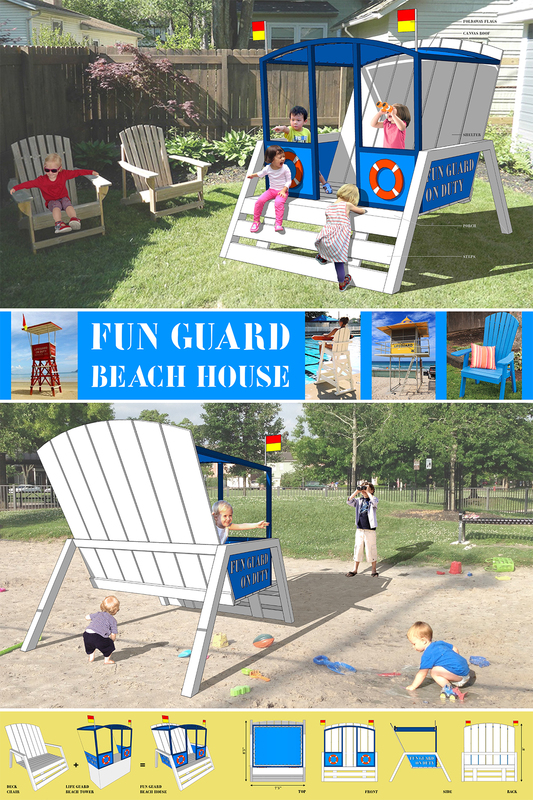 This is no small task and while it may seem a fairly simple enough process to select awesome playhouses – it’s not. These are surprisingly complicated little buildings and the criteria for evaluation is specific, but yet open for a wide range of interpretation. The judges had to take the 28 entries that were advanced in to the finals round and eliminate all but three (which will be built and donated to Dallas CASA (which stands for Court Appointed Special Advocates) which is a nonprofit organization of community volunteers trained and supervised to serve as voices in court for abused and neglected children. While I always think I want to be a judge during this process, I am normally glad that I am able to limit my responsibilities making sure that the judges have what they need to properly form their opinions. As always, the judging panel is made up of a wide variety of talents and opinions – something that I think is crucial to this process. I have no doubt that if I judged this competition by myself, the outcome would look slightly different. To help identify the judges in the image above, I have given them all a number – kind of like a criminal lineup. 1. Stuart Sampley – Architect, Austin Chapter AIA President, and current owner of one of the first 50 original Eames molded plywood lounge chairs that was previously owned by O’Neil Ford. 2. Dr. Michael Gross – architecture fan, and life saver. 3. Carmen Gross – Michael’s better half, charming, and wonderful story-teller. 4. Kelly Sampley – Austin based Fundraiser and Event Management specialist, wife of Stuart (which we won’t hold against her) and clown hater. 7. Michelle Borson – while she did not technically have a vote, Michelle certainly contributed to the process by wrangling everybody along because I was too busy telling stories and wasting time. These judging evenings would not run smoothly without her massive contributions as hostess insight. It’s important to note that Michelle has been in these judging events as long as I have and has valuable insight which she shares with the guest judges. 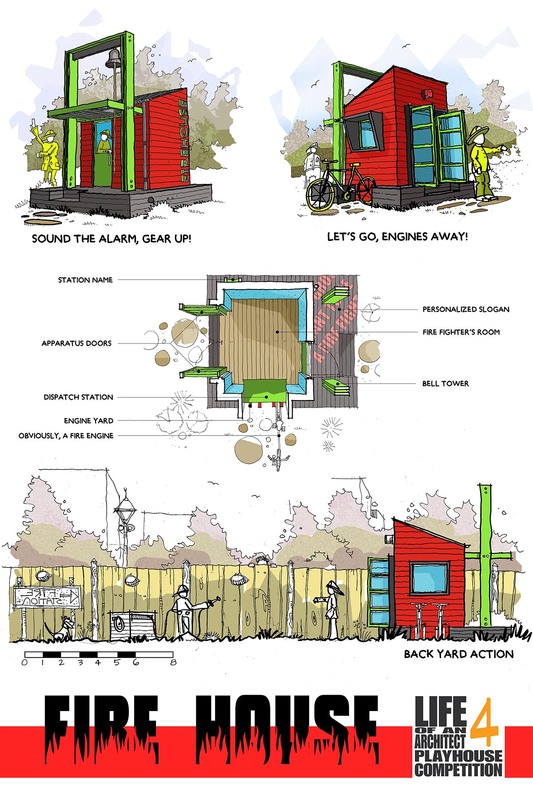 This years final judging round would certainly challenge everybody’s preconceived ideas about what makes a playhouse. Does it need to be an enclosed structure? What function would it serve over time? How would it age? Would people want his in their yard? Would a kid actually want this? How could we build this within the budget constraints and still keep the concept intact? Is it dangerous? Can you get proof of life from afar? These questions and many, many more were asked repeatedly about all the final entries. In all, the playhouses were reviewed individually by each judge who then picked their top 10 finalists. From those selections, we looked at where their were overlaps – did everyone pick similar entries? Were there an obvious group of winners? Turns out that everyone was pretty far apart and so we went through the list again and discussed each playhouse using the questions listed above. While that helped narrow down the list, there were still a few that we were having a hard time settling in on. These were our go-to decision makers – Murphy Sampley, Kate Borson, and Winfield Sampley. While it was difficult for the grownups to select the final 2 entries, it wasn’t for these kids. 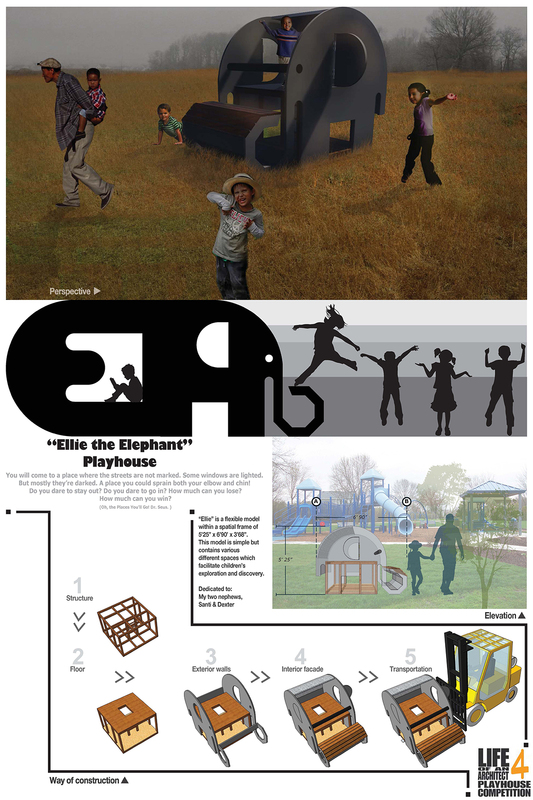 So it is with great pleasure that I am announcing the 2014 4th Annual Life of an Architect Playhouse Design Competitions Winners!! Bio: Born and raised Dallasite, practicing architecture/design for 16 years, UTA graduate, doing higher education work now but have done corporate, K-12, multifamily, and religious architecture. Musician in my spare time, and secretly wish I was doing modern residential (…or not so secretly). Bio: This is my second shot for the playhouse competition. When I first read about it in 2013 I thought: what a great idea! 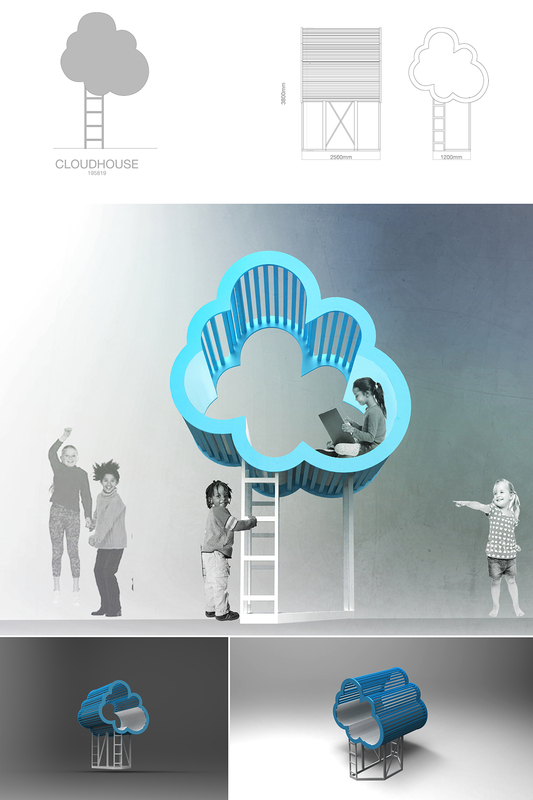 This competition combines so many things I love: design, kids, doing something for a good cause… I am an architect from Germany, who also worked in Singapore, Australia and Malaysia. 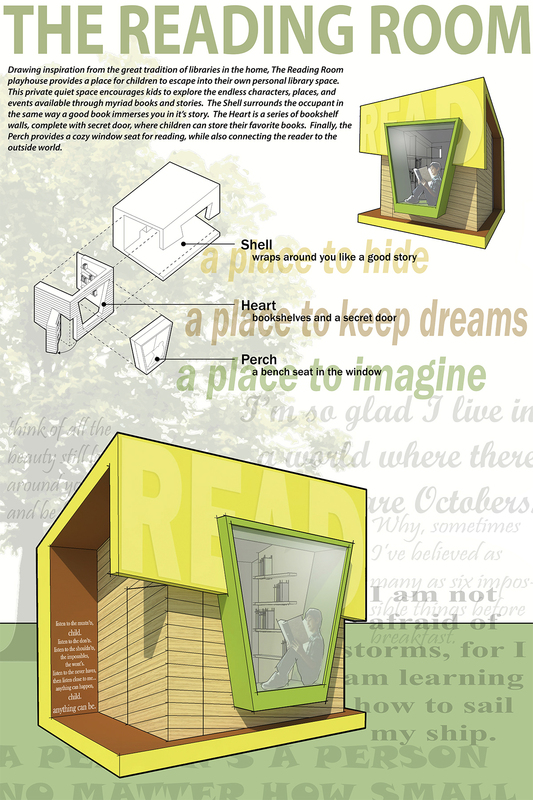 Right now I am living with my family in Houston and can’t wait to design more playhouses, for this competition and for our own backyard. This year I may even be able to see the results in person. Surprise me with something: Every time I am designing a playhouse for this competition I am expecting a baby. Or is it that every time I am expecting a baby I design a playhouse? Bio: We’re a team of two architecture students (Patrick Beck and Madeline Gonzalez) at the University of Miami. 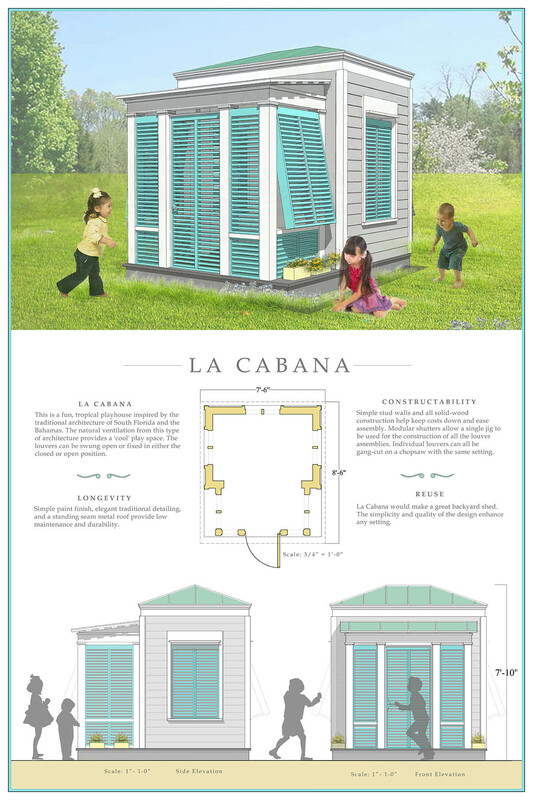 This playhouse is inspired by the fun, tropical-vernacular houses of Key West and the Bahamas. Patrick enjoys sailing on Biscayne Bay and woodworking, while Madeline is interested in graphic design, steampunk and rose cacti. Bio: I graduated from Moscow architecture university 2 years ago and immediately after graduation, I worked as an intern in Spain, Granada for two month, and then moved on to worked in Beijing for a year (as an intern first, later as junior architect. The year I spent in China was a tough challenge and has changed me a lot, I’m currently learning Chinese. Architecture competitions are what I do when I’m not working. Bio: 30-something designer working in Boston. I was conceived, born and raised in South Africa. Immigrated to USA 3 years ago. My wife is and American, but we met in West Africa. I have an 9 month old son, he is the bomb. I wonder what I am in for because he is a lot like me…..aaaaaarrrrrrrghhh! Surprise me with something: I hate snow, but with a laminated board attached to my feet, I seem a lot happier. Congratulations to the winners and I would like to extend a heartfelt Thank You! to everyone who took the time to participate in this competition. There are so many worthy entries that get submitted that I am going to institute a new rule – if your entry makes it in to the Final Judging Round, it will automatically be entered again in next years competition, and I am going to put this in place retroactively for the last three years. I know that with a different batch of judges, the outcome would have looked different and there’s no reason why we shouldn’t consider these amazing entries from year to year. I will be sending out an email to the winners to let them know that they are now on the clock for preparing their construction drawings ( … you probably thought the fun had come to an end too quickly).